Live Bait isn’t For Sissies! Unless you have been stuck indoors for the last few weeks you have seen and felt the obvious signs that fall is upon us. The stores are loaded with Halloween candy and costumes and the neighbor down the road has those obnoxious decorations up again this year. Also you have exchanged your short sleeve shirt for a hooded sweatshirt to beat the chill in the air. The changing of the season means one thing to a die-hard fisherman and that is the chance for that fish of a lifetime. The local rivers and lakes are starting to cool and the weeds are beginning to die off. This cooling triggers an instinct in most fish that winter is coming and that it is time to feed up for the long cold winter months. The fish will really start to feed heavily on the present forage and it is time to match the hatch. Cooling water and lack of daylight are the two triggers that affect these fish. It starts at the top of the food chain with the big toothy critters like the Musky and pike and works its way down to the smaller Perch and Bluegill. The natural instinct is to eat and eat they will. It is your challenge to hook into some of these giants and the perfect part of the puzzle for you is going to be live bait. To some the thought of using live bait is Taboo. It has a stigma of being for “cheaters” or the inexperienced. How wrong and untrue this is. Live bait, just like any other bait, has its place and time. With the cooling fall temps, that time is now. Whether you are using small minnows, large suckers, or live bluegill or perch (where legal) you are going to be at a large advantage to others at your chance for a big fish. Most Musky fisherman will agree that during the fall months their quarry is spending its time feeding on large fatty forage like ciscoes and suckers. Their best opportunity at entice a trophy is to hang a sucker off the side of the boat or under a balloon as a float to keep the prey just above the weeds. These fatty baits offer the musky a filling and nutrient rich meal that they will need for their winter survival. The large predators are not the only ones that are looking for an easy filling meal. Both largemouth and smallmouth bass are chasing schools of minnows and shad and the big fish are coming out of their weedy hiding places in search of an easy meal. Working large golden roaches on three way rigs or even under a slip float can offer a fisherman an opportunity to hook into fish that are well above the average they encounter in the summer months. When the water cools, I like to find the small perch that tend to be up in the shallows and with a small rod and bait catch myself a dozen or so of the smaller ones. These then end up on a large 1/0 circle hook on a lindy rig. One quick tip to use is; with a pair of scissors, cut the dorsal fin off of the perch. By doing so the perch cannot spine the inside of the bass’s mouth thus the fish will hold on much longer. This is deadly for late season smallmouth in and around the deep breaklines. 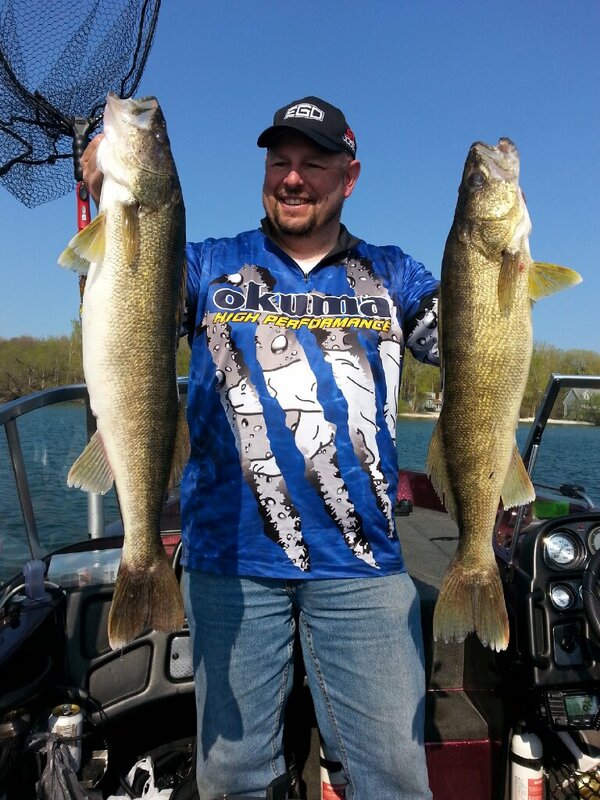 Walleye are making their moves in the rivers as well as lakes in search of food. In the evening hours these ferocious feeders are herding minnows into huge schools and then attacking when the time is right. Lindy rigging larger Fathead or sucker minnows along deep breaklines and weedy flats will offer up the chance to find that walleye you have only heard stories about. Those fish that dreams are made of. Using live bait can be as easy as a simple float and a hook, or you can mix things up by working a bottom bouncer and structure fishing. The key to any live bait presentation is to get the bait to where the fish are going to be. It sounds obvious, but it is often overlooked. You can’t catch the fish that are cruising the breaklines if your bait is up on the flat. Boat positioning and bait presentation are key points to using live bait. Key positioning of your bait is especially important to those that are in search of the bottom dwelling catfish. During the colder water period these fish are not going to move far to find their food and you need to bring the food to them. Live bluegills, shad, or shiners are prime for these fish. Lively bait creates vibrations in the water that a fish can easily hone in on. With the cooling air temps and water it is key to remain flexible with your presentations and don’t rule out using live bait to increase your odds at catching more fish. Not only will you catch more fish, but also you will be surprised at the size of the fish you will catch. It is the time of year for the fish to fatten up and the big girls are coming out to feed. Don’t miss the opportunity for a fish of a lifetime. Live bait isn’t just for kids anymore.